An ambition of anyone who loves the work of Shakespeare must sure to broaden the appeal of his stories without necessarily diluting the gift of his use of language. This is not an easy task, however, director Simon Godwin has certainly delivered. We have already stated that Newcastle’s Northern Stage is having a cracking season and visitors this week are in for a real treat. Whilst Hamlet is one of his longer plays, it is as good a place as any to start as the play will come across as having a familiar theme and a large number of lines from the play have gained common usage. The tale involves the death of the King and the succession by his brother, Claudius. To make matters worse for the old King’s son Hamlet, his mother Gertrude marries his Uncle. Hamlet decides to avenge the death of his father. If that sounds familiar then it is worth noting that The Lion King borrows liberally from the themes of Hamlet. Designer Paul Wills has created what initially looks like a simple set but the set quickly reveals openings which enable the continuous flow of the action. It has to be said that this is a very colourful Hamlet, helped in no small measure, by the costume design. It is also a very loud production at times, especially at the start. Percussion work, on stage, from Sola Akingbola and Sidiki Dembele is both visually and aurally stimulating. This show is both bright and engaging. The musical interludes helped separate the scenes from time to time. Shakespeare’s work is very word heavy. A lot of talking goes on, rather than physical action, and so it is important to have a cast that are both clear in their diction and engaging with the cast. This version of Hamlet is blessed with a superb ensemble cast with no weak links. The players support one another and so the language comes across as natural rather than stilted. 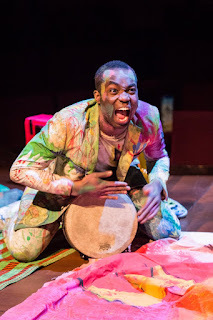 Paapa Essiedu is a revelation in the titular role. He conveys the passion and the anger of a son hell bent on revenge. 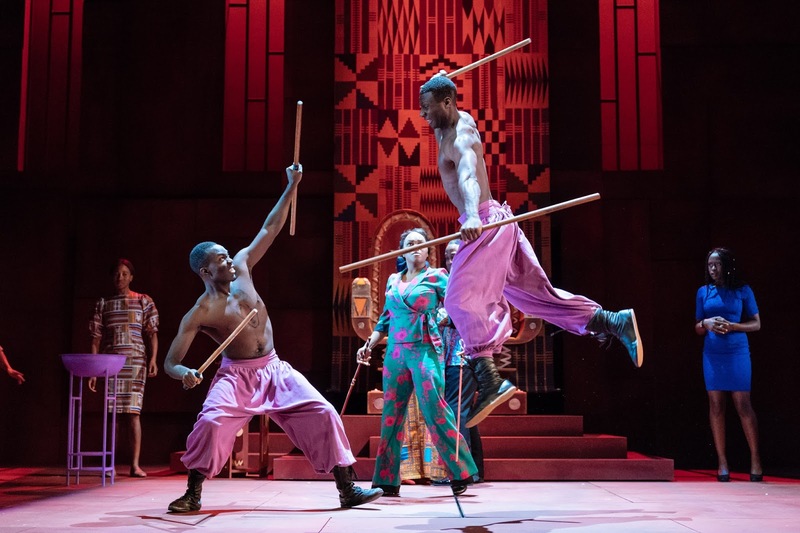 Clarence Smith has presence as the new King Claudius, Lorna Brown has great strength in her portrayal as Queen Gertrude. Polonius is the thoughtful and robust advisor to the King and Joseph Mydell nails the role. 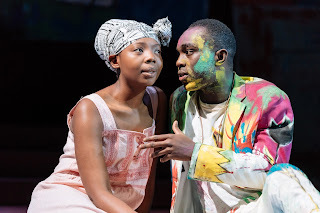 Mimi Ndiweni shows real passion as his daughter Ophelia. Buom Tihngang presents Polonius’s son as a man with a clear mission towards the end of the tragedy. Supporting Hamlet are a number of close friends and James Cooney, Esther Niles and Eleanor Wyld are fine supporting actors as Horatio, Rosencratz and Guildenstein respectively. 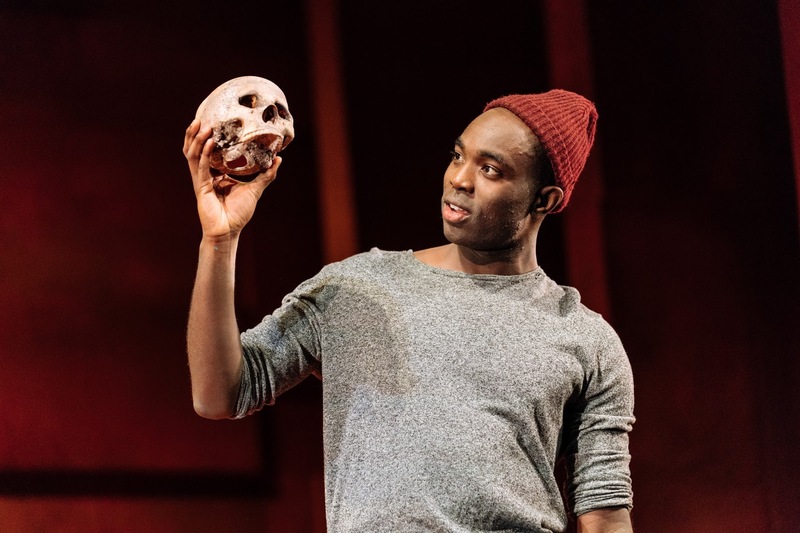 They enabled Paapa Essiedu to really thrive as Hamlet and help make the show a really special experience. Clocking in at just under 3 hours, plus interval, the action and words have to be engaging or you will lose the audience. The soliloquies were not laboured and were naturally delivered, likewise the dialogue helped make the story accessible. This is a wonderful body of work that had the audience buzzing with pride as they left the sold-out performance. The Northern Stage provides a great venue for work of this magnitude and I hope to see the RSC back here soon.